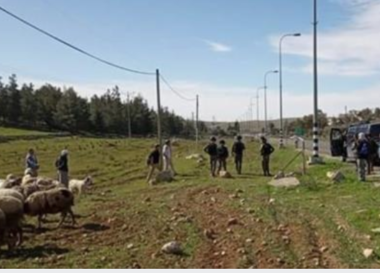 A group of extremist illegal Israeli colonialist settlers attacked, Saturday, many Palestinian farmers while working on their own lands, and several shepherds, in Yatta town, south of the southern West Bank city of Hebron, causing them to suffer cuts and bruises. Rateb Jabour, the coordinator of the National and Popular Committees against the Annexation Wall and Colonies in southern West Bank, said the colonists attacked many farmers in at-Tiwana, Susiya and Khirbat Umm al-Amid communities, in Yatta, and assaulted many Palestinian farmers and shepherds. Jabour added that the settlers also used their dogs in attacking the Palestinians, causing injuries. Three of the wounded Palestinians have been identified as Nasr Nawaj’a, Ahmad Khaled Najjar and Jabr Zein. Nawaj’a, who is also a nonviolent activist against the Israeli occupation and its colonies, said the colonists unleashed dogs on him, before the dogs mauled and bit him in his arms and legs. He was then moved to Abu al-Hasan al-Qassem hospital, in Yatta town. Jabour denounced the latest attack and stated that it was part of numerous assaults and violations by the illegal colonialist settlers against the Palestinians and their lands, amidst military and political protection from the Israeli occupation, and its judicial system.